Amaranthus, collectively kent as amaranth, is a cosmopolitan genus o annual or short-lived perennial plants. 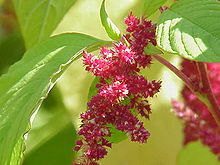 Some amaranth species are cultivatit as leaf vegetables, pseudocereals, an ornamental plants. ↑ "Amaranthaceae | plant family". Retrieved 2015-06-02. ↑ 2.0 2.1 "Search results — The Plant List". theplantlist.org. This page wis last eeditit on 20 Mairch 2017, at 03:16.